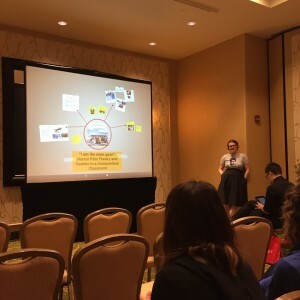 Jennifer Jackson presented a paper at the 2015 Pop Culture Association conference in New Orleans on Friday, April 3. On a Composition and Pop Culture themed panel, Jennifer presented her experiences teaching a successful writing course on the theory of horror film in the spring of 2014. Her paper, titled “‘I am the male gaze’: Horror Film Theory and Gender in a Composition Classroom,” explored the development of the course at the University of Arkansas at Monticello; the paper particularly focused on the significant role that gender theory played alongside horror theory in not only teaching students about horror film, critical analysis, and argument but also about opened dialogue in her class about real world issues like sexism and the “male gaze.” In her presentation, she offered a list of films she showed to the class, required texts, and a brief look at assignments from the course, including multi-modal extra credit opportunities and a multi-modal final. Also emphasized in her presentation were student responses and engagement in the course; she spent equal time discussing the most involved students and the most hostile, in this way opening a dialogue in the Q and A at the end on student behavior and response. Jennifer has proposed to teach a similar course at the University of Mississippi as a LIBA102, and her presentation on her class at PCA helped her more deeply reflect on what worked about the course and what she would like to revise. Overall, presenting her work and discussing it with others was an overwhelmingly enriching experience.